The political Islam movement in Yemen is unlike its counterparts elsewhere in the Arab world. In the course of the last quarter of a century, since 1990, the Muslim Brotherhood through its political wing, the Yemeni Congregation for Reform (Al-Islah), has been officially allowed to take part in all political processes and its leaders were generally represented in government bodies and agencies. In some phases, Islah not only worked with the regime as a political arm but also as a military arm, with its militias taking part in the regime’s confrontations in the south following the war of unification in the summer of 1994 and in its six wars against the Houthis. But it also opposed the regime at times, joining the opposition Joint Meeting Parties (JMP) in alliance with the socialist and Nasserist movements against the ruling General People’s Congress (GPC). The Muslim Brotherhood/Islah was strongly supported by the number two man in the pre-revolutionary regime, Major General Mohsen Al-Ahmar, commander of the 1st Armoured Division. It thus had its own commanders and particular allegiances within the official armed forces, as well as in the intelligence agencies. Acting chairman of the Islah Party Colonel Mohammed Abdullah Al-Yadoumi was an officer in the Political Security Service. The political narratives that are circulating today in Yemen relate that the fall of Sanaa to the Houthis on 21 September was about settling scores between the Houthis and Islah. However, the ever-pragmatic Islah did not fall into the trap. In spite of its sharp differences with the Houthis, it bowed to the new de facto reality, signed the Peace and Partnership Agreement and became part of the current government led by Khaled Bahah. The Houthis maintain that the unmasking of the Muslim Brotherhood regionally delivered a painful blow to the organisation’s Yemeni chapter, which strengthened its resolve to continue to exclude the Houthis even after the February revolution. The fall of Sanaa, or what the Houthis refer to as the 21 September Revolution, was a response to ongoing attempts to exclude them from decision-making processes. Islah counters that it had not been part of the government or power structure so as to be in a position to exclude others. A third narrative holds that the fact that the Muslim Brothers bent before the Houthi storm does not mean that the battle is over. The current phase is merely the eye of the hurricane and more rounds of conflict between the two sides will erupt eventually. 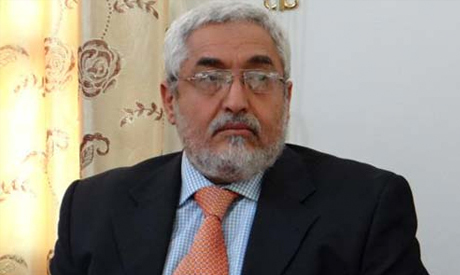 Ahram Online met with Mohammed Qahtan, a member of the Supreme Committee of Al-Islah and a leader of the JMP, in order to learn the views of his party on the current situation in Yemen, the accusations Islah faces, and its vision for its role in the country’s future. Do you not agree that the Peace and Partnership Agreement superseded the Gulf initiative? In some respects, yes. But there are other points that continue to apply. On forming the new government, for example, the agreement proposed a vision different to that in the Gulf initiative. However, it simultaneously preserved the points regarding the completion of — and referendum on — the new constitution, the holding of elections, and the continuation of the presidency as they are in the framework of the Gulf initiative. Yet, at the same time, the agreement permitted the presence of a new movement in the political process, namely the Houthis. Correct? You cannot say “permitted”, but you can say “legitimised” the presence of the Houthis. They invaded and took control over Sanaa and then continued to extend their control. The agreement was signed beneath the rumble of guns and by force of realities on the ground. Up to the moment the agreement was signed, the situation was in favour of the Houthis. But you acceded to that reality and offered no resistance? We are a civil political party. A part of the people was prepared to support the government in any position it took. This is what people do when countries and their governments face crises: they rally behind them. That was our stance. So when we saw that the authorities did not intervene to stop the Houthis, we took the same position. But the fall of Sanaa on 21 September is still shrouded in mystery. There are some secrets behind the scenes. How were the Houthi forces able to gain control over the 1st Armoured Division? Why was there no Islah presence in the streets and squares? With regard to Islah, quite simply we were part of the national ranks. The authorities had told the national ranks to be prepared to defend Sanaa and we were ready to act in this framework. But at the last moment, we saw that the army was not acting and nor was the Ministry of Defence. The 1st Armoured Division, for its part, was not even on hand, practically speaking, at the time of the invasion. It had left its headquarters, leaving only a couple of infantry brigades. As a result, the headquarters of the sixth region is now headed by someone from Ali Abdullah Saleh’s group, or those affiliated with it. Were there parties that tried to drag you into battle? There were, but we refused to be dragged for reasons having to do with our consideration of the other side. From the juridical standpoint, fighting the Houthis would only be possible in the context of their defiance of the government. We do not brand them as heretics. They are the ones who are fighting others and who have a takfiri outlook. As for us, we feel that the only condition that sanctions a domestic battle is when a group acts against the legitimate authority. Therefore, if we moved to engage in bilateral resistance, which is to say if we engaged the Houthis in battle at a time when the government has not even declared battle, the situation would degenerate into civil war. The government is the only authority with the legitimacy to use force. With regard to the army, we ourselves are still wondering whether there were deals. Yes, the involvement of Ali Abdullah Saleh was clear before the fall of Sanaa and during it. His partnership with the Houthis was a powerfully operative factor. It was the GPC that entered Sanaa, while the Houthis were in charge of the management and control. The Houthi movement today has become a political faction. But what about the policing presence in the streets. And how acceptable is the banner they are raising, which is the same religious political banner as the Iranian revolution. Is this a natural situation or the sign of a new plan of action? Of course it is not normal or acceptable. The only hope is to apply the provisions of the Peace and Partnership Agreement that states that the Houthi militias must ultimately withdraw and lay down their arms. That is in the security annex to the agreement. But now they are insisting that their militias be incorporated into the army, like your approximately 150,000 troops had been. The agreement has to be implemented because the country is heading into the unknown. Was the invasion of Sanaa a way to settle scores with you? We endured some abuses, but we refused to be dragged into civil war. Your experience is different from that of the Muslim Brotherhood in Egypt and Tunisia. However, do you feel that you were exposed when the Muslim Brotherhood was unmasked there? We might have some small resemblance to the Muslim Brotherhood in Tunisia, but the case of Egypt is totally different. During the period of covert activity in the 1990s, before we formed Al-Islah Party, we took part in the first national assembly that was formed in north Yemen. It was the first elected council we took part in. That meant that there was no longer any room for us to avoid society. We had become involved in the political process. Since the establishment of the unified nation, we were never absent from any elected body, whether at the local or national level. Even in the south, the founders of the organisation were on good terms with President Qathan of the People’s Democratic Republic. So we were characterised by not excluding society and not taking a hostile stance towards government. When political plurality was introduced we shared power with the Socialist Party and we entered a tripartite coalition. After the 1994 war, the Socialist Party was weakened and moved into the opposition. Then in the 1997 elections we were voted out of power, so we joined the opposition bloc and formed the JMP. We differ from the Muslim Brotherhood in our nature, our work, and the course we have chosen. This is not because we are better but rather because Yemen’s social environment is conducive to this. It does not accept religious extremist tendencies in general. Even the socialists could not have gone as far to the left to create a communist party as occurred in Iraq, for example. You know that there are schools of thought that see socialist ideas in Islam. When we formed our party, we did not want to call ourselves the Islamic Party or anything of that sort. It would have been rejected by the people. When it comes to Arab nationalism or Islam in Yemen, it would be hard for any one party to claim to speak in its name. Therefore, we chose a name that underscored a Yemeni concept — reform — and that simultaneously underscored our approach as a Yemeni party. In light of the existing nation state system, we do not believe in transnational political parties. In other words, we do not agree to the idea of a central leadership in the Arab nation or Islamic world that issues decisions for others, or to which others are subordinate, as though that leadership is the source and others are branches. But the results of the Tunisian elections that removed the Muslim Brotherhood from power, or the fall of the Muslim Brotherhood in Egypt, haven’t affected you? I believe that the situation in Egypt, from our vantage point as Muslim Brothers, has not affected us. However, Egypt is an influential country and what happens there does affect us, but not as Muslim Brothers per se. Would you say that your views diverge from those of the Muslim Brotherhood in Egypt? I would say that Egypt has always been concerned for Yemen. In the modern era, I believe that what the Egyptian Muslim Brotherhood did during the 1948 revolution in Yemen came from them and we did not support it. By contrast, when Yemen’s 1962 Revolution came, that was supported by President Gamal Abdel Nasser in a way that reflected the aims and aspirations of the Yemeni people. This was far better than what the Muslim Brothers in Egypt supported in 1948. We feel that Abdel Nasser’s efforts on behalf of the Yemeni people were more effective and more in line with the Yemeni people’s needs than the Muslim Brotherhood’s project. In Islah’s programme that was established in September 1994 we praised the role of Egypt, the Egyptian army and the Egyptian leadership in supporting the Yemeni republic. The majority of Yemenis see the role that Abdel Nasser played in Yemen in a positive light and we are part of the people. Unlike the Muslim Brothers in Egypt, our view of Abdel Nasser is not shaped by what happened in Egypt but rather by the part that Abdel Nasser’s Egypt played in leading Yemen out of a condition of extreme backwardness and helping it move forward. Our difference with the Egyptian Muslim Brothers resides in the fact that they maintained relations with individuals who supported the constitutional monarchy. We criticised those Muslim Brothers who tried to criticise the role of the Egyptian army and Abdel Nasser. We said we are not with them but with the Egyptian people who support Abdel Nasser who sent an army to Yemen to help establish the republic and another army of teachers to educate us. Even the University of Sanaa was staffed by Egyptian professors. Would you describe the current juncture in Yemen as a transient phase or a turning point that will usher in a new reality? I cannot rule out the possibility of interventions by regional powers in Yemen. Certainly the Houthi’s success in seizing control over Sanaa pleased a number of official and popular circles in Iran. Whether his situation is transitory or not depends on another regional party. They also claim that you have relations with Saudi Arabia and that you used these relations against them. What do have to say about this? Our relations with the Saudi kingdom are normal. But I can say that when you look at the past when both Saudi Arabia and Egypt were involved in Yemen in 1962, the Saudis had one view and the Egyptians another and the Saudis were not as able to promote their view as did Egypt. Ultimately, Egypt compromised and offered reconciliation. But the general outlook that Egypt brought to the Yemeni people is the one that remained. But after the reconciliation between Saudi Arabia and Egypt, Saudi influence in Yemen continued while Egypt moved away from the country even though, historically, from the Ayubid era and Mameluk era, and even through the monarchic era that preceded the republic, Egypt had never abandoned Yemen. Egypt has had a powerful impact on Yemen. We were taught by Egyptian teachers on the basis of Egyptian curricula. Our law is Egyptian. And even when we Yemenised all those things they remained close to the Egyptian models. Today, under the current circumstances here and at the regional level, there is a considerable meeting of minds between Egypt under President El-Sisi and Saudi Arabia. Therefore, there is no regional reorientation of any sort. And there is coordination between Egypt and Saudi Arabia. However, I cannot say what the Egyptian-Saudi vision in its perspective on the region is exactly. There are certain signs that give indications, but what the vision is precisely I don’t know. As for us at the domestic level, we believe that it is unacceptable to let military force prevail. In Yemen, only national partnership and the division of power among political entities can work. Is this the conclusion that you reached recently? Much has been said about us. But there are parties that tried to blow things out of proportion in order to find an excuse to gain the eye of the two regional powers, Egypt and Saudi Arabia. So you welcome the new situation. Not at all. We are dealing with the existing reality. Even if that new reality reduces your influence in power and in the street? The Iman University, which belonged to you, was closed in the context of these events, for example. The Iman University does not belong to Al-Islah Party and never did. It is the personal property of its owner. But it was a symbol for you? Yes, that’s true. However, we have said that the Ministry of Higher Education needs to issue a law regulating private universities, including Iman University. The ministry should supervise all community education to ensure that it harmonises with the national dimension and the official policies of the state. Former President Ali Abdullah Saleh and his party is now a partner in the government too. Do you deal with him as a representative of a faction that has a political presence, or as an enemy? The former president’s party had 50 per cent of the cabinet seats, which is to say 16 ministers, and we in Al-Islah had four. They put us together with President Hadi, forcing difficult choices on us. We felt that that course of action would weaken the head of state. But we went along with it anyway so as not to create a crisis. Also, we did not approve of the way the hike in fuel prices was handled, but we do not want to weaken the state. Opposition under these circumstances would have weakened the state and we are not in a position to oppose. As for Ali Abdullah Saleh, we prefer not to use the term “enemy” when referring to fellow citizens of the same nation. Rather, we call him an adversary of us, and of the people. But he still has power and influence? Yes. He has retained influence. First, in the Republican Guards — apart from the brigade of his son, Ahmed, and one or two other commanders, all the other commanders that he had appointed are still in their posts. So he retains considerable influence. Also, during the recent period, the Ministry of Defence and Chief of Staffs have been unable to project a positive image of the army as an institution because they were just labels in the Saleh presidency and sometimes there were orders instructing them not to intervene in the Republican Guards. During the interim period, their mindsets remained the same. They were mistaken to have kept the people who were in office under Saleh. New faces would have solved the crisis. But they were unable to realise any of the people’s hopes and aspirations, not even to reduce financial corruption. So they lost the sympathy of the institution. In their phase, they effectively assumed the powers of the defence minister and chief of staffs, but they failed to assume the appropriate level of responsibility. Instead, they continued in the same mode as the old order, with the parallel structures and the personal allegiances that managed everything outside the official lines of command. With regard to the Houthis, would you accept the Hizbullah model for Yemen? Or is this model a reality that is imposing itself? We have already stated clearly that we reject the notion of any party that claims a mandate over the state or of any party other than state that possesses arms, especially heavy weaponry. This applies to any party whatsoever. We said this in the national dialogue on numerous occasions. We said that political life in the country would never be normal as long as some political faction retains a parallel army. This is why we believe that the Gulf initiative offered a glimmer of light at the end of the tunnel, because it speaks of the need to surrender arms so that the state alone can have a monopoly on them. Has there been distortion of the Zaidi seat or faith? Zaidiya was the ruling sect in Yemen for a long time. The notion that it has been marginalised or oppressed is mistaken. We in our parties have members who are Zaidis as well as Shafeis. The head of our party was a Zaidi. But what happened was that the Zaidi leaders from the north objected to the hierarchy stipulated by their sect: the “sayyid” (a title conferred on a person that claims direct descent from the ProphetMohammed) first, followed by judge, then sheikh, then class hierarchy. Some continued to preserve the essence of this culture, but altering the hierarchy to make the sheikh or the judge first, so as to diminish the status of the sayyid. Historically within the Zaidi sect there occurred a sort of rise in extremism on the part of those that called themselves “Jaroudis”, whose ideas approached Twelver Shiism. That thinking gained ascendency in some periods and came under criticism even by some Zaidis because it regarded the Sunni Shafies as heretics. With the rise of Jaroudi thinking there arose the idea of celebrating the Day of Al-Ghadir (a holiday observed by Shia Muslims commemorating the appointment of Ali Ibn Abi Talib by the Prophet Mohammed as his successor). This idea is being revived by Zaidis today. For example, the chant to this effect that they have begun to utter during Friday prayers contradicts the traditions of the Zaidi sect and is close to Twelver Shiism. I believe that people are free in their beliefs. However, there also has to be a nation state that monopolises power and recourse to arms. That state must be neutral with regard to sects. But there is one matter on which we do not accept neutrality. This is the question as to who is the source of political authority. Sadly, the jurisprudential theories on this question in our heritage have not expressed the true spirit of Islam. The Sunnis here talk about restricting power to the Qureish (the most powerful tribe of Mecca during the time of the Prophet Mohammed). The Twelvers would have us confine it to their 12 imams. The Zaidis restrict it to the descendants of Al-Hassan and Al-Hussein. We believe that all these theories are wrong, even if certain historical circumstances had justified them in the past. Therefore, the neutrality of the state toward sects cannot extend to this question. In 1962, the Yemeni people, with the kind support from their brothers in Egypt — and despite the Egyptian blood that was shed here — confirmed their belief in the republican system and the principle that the people are the source of the government’s authority. There can be no compromising on this principle and the republican theory. At the very least, the Houthis have to say that they accept this. We need a nation state that offers partnership to all and in which every person is free in his beliefs. We are for democracy and the principle that the people are the source of power. How do you stand on the question of the south with respect to recent developments in Yemen, especially taking into consideration the resurgence of calls for secession? When the national dialogue conference approved a package of resolutions in favour of the south, observers took note of the relative calm and the fact that all attempts to inflame the public on the part of extremists from the southern movement met with failure. But when the Houthis moved from Saada and gained control over Aden, they issued a negative message. So too did President Hadi, and now former President Saleh has issued similar messages. All gave indications that the southern question will be reviewed again, which has generated some anxiety among southerners. Still, if the majority of the south can be convinced that a nation state will be established in accordance with the outputs of the national dialogue on the southern question, there will be renewed confidence. The Socialist Party proposed the idea of two federated regions. Would this, or the idea of a federation with five regions, solve the problem of the south? The federal state might have solved the problem of the relationship between the north and the south, but not the problems of relations in the south or north. I believe that the idea of many regions is logical and it was well received by the southerners during the national dialogue. If the southerners work to build a state in accordance with the outputs of the national dialogue they will be fundamental partners in the political equation. No faction will dominate others by force of arms, and the army will be rebuilt on national foundations. If all these considerations are put into effect, everyone will be satisfied. In sum, either we move towards implementing the outputs of the national dialogue that we all agreed on, or we propel matters towards different options for all sides. *This story was first published by Al-Ahram Weekly.